Other random Michelle news of the day after the jump. When Prom Night Comes Back to Bite You In the Thigh: Lord. This has only just begun what I will believe will be a trend in anyone who ever once starred lovingly, swamped spit, held hands or touched an Obama in the act of dating revealing all to whoever will pay them the duckets. David said: ‘I grew up with Michelle and her brother Craig. We were neighbours, and our families were close. ‘When Michelle was in the middle of her junior year, we began dating and continued to date for a year-and-a-half. He says he can’t even remember if he received a goodnight kiss after the prom. The romance ended when Michelle went off to Princeton to study sociology. Perhaps mindful that her husband is the President, David refuses to ‘kiss and tell’ about their time together. I seriously think they only wanted this dude’s story to get the prom pick because Michelle is rocking all kinds of thigh. Like, more thigh than you will ever get to see. Enjoy it while you can, Michelle leg lovers! Damn, if Sasha don’t look like her mama!! The First Lady was killing it with that split. Yeah. I totally don’t get the backdrop, but I can’t say my prom pics looked much better. At least I was standing. But there is something very "Solid Gold" dancer about that dress and those shoes. Everything about that photo screams "It Came From the 80s." I’m so totally digging that Oprah cover because I love the bright colors of both of their dresses. lmao, Oprah doing the evil Mr. Burns laugh. excellentOMG, if that is not the most pimp-a-licious prom photo? What is it about Black people and those circular wicker chairs??? Michelle looks so pretty on the cover of O, Oprah looks good to. That prom picture is like, mad eighties!!!! My mom has a picture of herself in one of those wicker chairs, hee. I think that the man that the first lady used to date is being good compared to what he could be saying. Wow! I can’t wait to get my issue in the mail! LOL @ that circular wicker chair! I love the O cover! I can’t believe Oprah let her on lol That prom pic looks so old! But Michelle is workin those legs though. Thank God he didn’t end up being her husband. I guess we can surmise that Michelle kept her innocence in high school, and her relationship with David stayed chaste. Maybe. She would have driven me crazy showing her thigh like that with her fresh face. I bet she was a good girl. The desert colored flora doesn’t sit well with my soul. Neither does the fact that her date looks like he could buy alcoholic beverages without being carded. am i the only one who thinks oprah needs to take a holiday…. she really should have given the whole cover to michelle.. but noo.. her damned ego got in the way again…just selfish.. I might actually buy a copy of the O’s rag, great picture though I think she should have given Michelle the entire cover. LOL @ that ole skool picture, it seems many Black folks of a certain age group has a picture in the wicker chair. I’m glad to see Michelle sharing the O cover with Oprah, but I think the picture looks like a bad candid. Michelle’s body looks fierce and I love her outfit and the color of both dresses, but for me, it looks like a picture that was snapped when neither one was ready. They are not looking at each other and don’t appear to be engaged in the same conversation. In fact, Michelle appears to be talking and Oprah might be too, but they’re not connected. It’s not a beautiful candid shot that captures a an intimate moment between two people nor is it an obviously, but at least beautifully staged photograph. I’m actually surprised and befuddled that they picked it for the cover. BTW, the prom dress is so solid gold/ hood it’s crazy. I guess Michelle grew into her taste in fashion sometime after this picture was taken. *just looked at the cover picture again* It’s a terrible shot. I can’t even handle how bad it is. Quasi-candid, yet photo-shopped to death. arrrgghh! The Prom picture cracks me up. 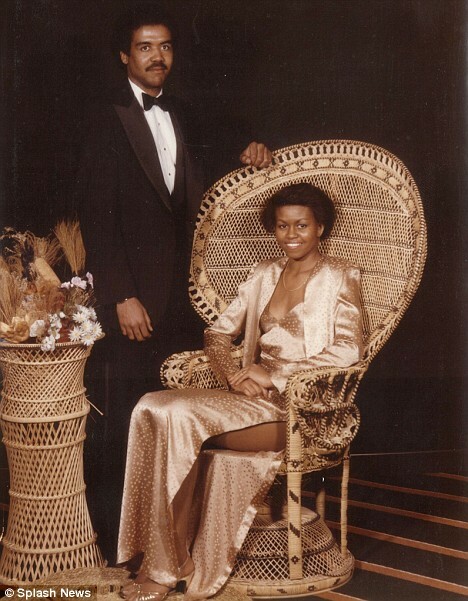 There is an entire generation of Black urban prom goers with that wicker chair in their pics..LOLThe slit and cleavage tell me that even ‘ back in the day’, Michelle Obama was comfortable with her body. Love the bright spring colors of the shot, love what Michelle’s wearing, but it seems like they got caught by surprise. Oprah, especially. She normally smiles much wider in her covers. Oprah, like Martha Stewart, will someday learn she doesn’t have to be on every mag cover. I needed a good chuckle today. Michelle is giving it to us 80’s style in that picture. I think every black woman at a certain age had that same hair style!! LOL. I love it. My father has left a chair similar to that one to me upon his death.